Social selling sourced or influenced/attributed deals are making up greater than 50% of a sales rep’s quota in a variety of industries, recent empirical data from LinkedIn has found. 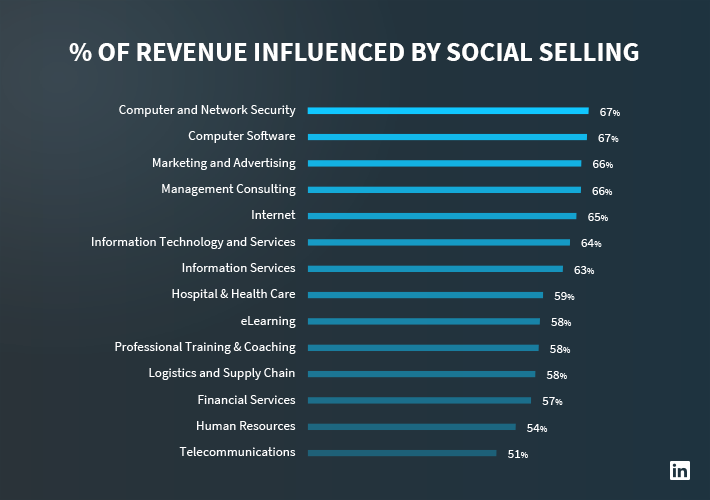 Out of all the 14 industries LinkedIn analyzed (shown below), more than half of their revenue is influenced by Sales Navigator. While certain industries like tech shouldn’t come as a surprise, less progressive ones finance or logistics and supply chain are. What’s more is that when deals associated with social selling are influenced by Sales Navigator, win-rate increases by 5% and deal size by 35%. With the evidence around digital surmounting, sales leaders should be asking themselves, What is my team doing to address this opportunity? And where is my skills gap? *This is a summary of Investigating the Truth About Social Selling by Industry by Ethan Andrianos. How do high-performing organizations structure and deliver sales onboarding for maximum results? *This is a summary of SiriusDecisions State of Sales Onboarding Report by Highspot. Both rookies and veterans make mistakes—it’s a fact not only in life but also in sales. Renowned sales executive and author Jeff Hoffman outlines the 3 biggest mistakes he sees seasoned reps make, and how to avoid them. Using techniques like social proximity, salespeople cover a lot of ground quickly by targeting similar buyers they’ve already served. However, many get caught in dismissing an ICP because they don’t match the DNA of their typical buyer. To combat this mentality, Hoffman advises 10-15% of the deals a salesperson is working should be “risky,” or outside of the typical buyer persona. Familiarity breeds complacency, observes Hoffman. The longer the salesperson stays in the role, the more champions they have, and the more they depend on those champions to connect them with more business. -Do you know who all of the current customer stakeholders are? -Who’s left since I last surveyed the account? Who’s joined? Who’s gotten a promotion? Who’s moved teams? -Which business units, departments, or office locations should I target next? According to HubSpot Research, the majority of salespeople with five-plus years of experience say that when they find something works, they don’t change it. This is clearly an issue. What worked in 2000 certainly doesn’t work today. Technology, industries, and buyers change dramatically even in a few years. Stay relevant by continually educating yourself through blogs, podcasts, training, and the like. *This is a summary of The 3 Quota-Killing Mistakes Only Experienced Salespeople Make by Jeff Hoffman.